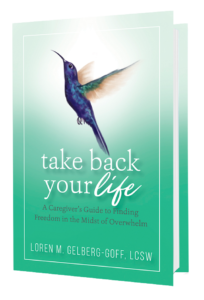 The following snippet is from the first chapter Take Back Your Life: A Caregiver’s Guide to Finding Freedom in the Midst of Overwhelm, which is called My Desired Outcome (no surprise there, right?). I wanted to share it with you today after this season of overwhelming winter weather that for many people turned the normal logistics of care management into a hugely stressful ordeal. Seems like a great opportunity for a reminder about the nearly universal tendency of caregivers: to postpone or ignore their own needs, and just keep pushing ahead to meet the needs of others…no matter what the cost to them…. If that’s been you lately, I hope it serves as a helpful wakeup call to recognize when you’re falling into that mode, and to remember the importance of “putting your own oxygen mask on” first! As a caregiver, you have been committed to providing support, compassion, help and care for someone in your life. If you’ve been a caregiver for a long time, then some truly significant and powerful habits and beliefs have already set in. Most caregivers, whether they came into this role by choice or by default, are compassionate, nurturing and selfless individuals. If you are like them, you’d much rather do things for others than have others do anything for you. You rarely, if ever, actively think about what you want or need…though it may be a nagging thought or feeling in the recesses of your mind. And when it does pop up as more than a vague awareness, you ignore it, deflect it, silently implode, or – for the moment – loudly explode…and then the cycle resumes. While not very pleasing or inspiring, this has been a pattern in your life. You put one foot in front of the other and just keep on going. 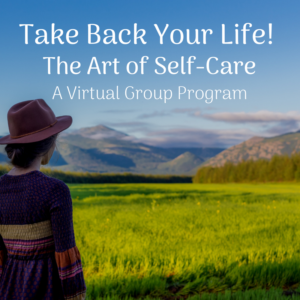 For most caregivers I have worked with, their number one desired outcome, after ensuring their loved one is safe and well cared for, is simply to get a break. Yet somehow, getting a break always seems so elusive. They tell me something inevitably pops up to interfere with satisfying even this modest goal. How many of these expressions of defeat and resignation sound like you? Food for thought: when you become aware of these thoughts running through your head, that’s a signal that you MUST arrange for some regular breaks to replenish your mind, body and spirit! It doesn’t even have to mean something ambitious like a whole day off, though that would be great if you can swing it. Effective downtime can be created in small steps and moments of breathing and stillness…. Or give yourself permission for something that puts a smile on your face – a conversation with a friend (in which complaining or even talking about your stress level is forbidden! ), or your favorite upbeat music video, or a TV sitcom. Anything to make a clean break from obligations or deadlines long enough to breathe deeply, have a belly laugh or indulge in the latest hot gossip. If you are so out of practice with self-care that you can’t even think of what activities you might choose, there are lots of strategies in the book – use it as a handy reference tool to get you unstuck! In the meantime, use my Caregiver’s Step By Step Guide – my gift to you, to help you create a new habit of shifting quickly – from “stuck and stressed” to “clear and calm, moving forward.” I designed it to be your go-to guide that you grab when you’re feeling overwhelmed and frustrated, so you really can take that first step in the direction that takes the best care of you. After reading this I realized I’m doing some of those things. My husband has had problems since last Oct Now it’s different things and we’re trying to find out what’s going in with him. So yes I am trying to do everything and putting off my things.